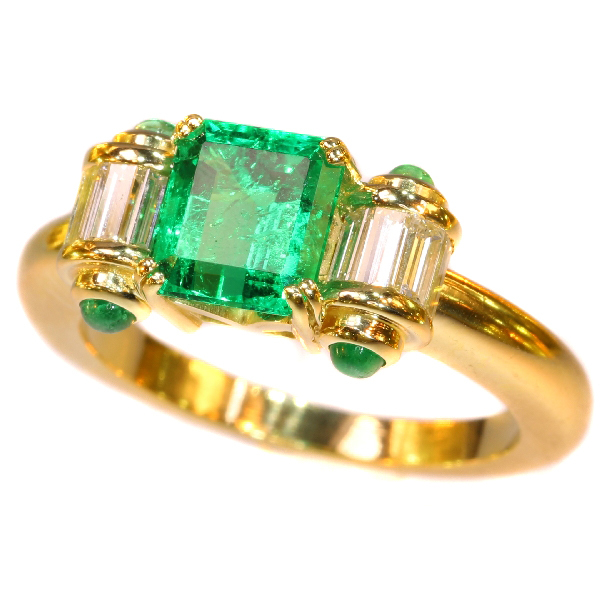 Estate engagement ring with top emerald and diamonds: Description by Adin Antique Jewelry. What makes a good piece of antique jewelry, a good piece of antique jewelry? The answer to this question is simple as can be. A good piece of antique jewelry should be a good style representative for the period it was made in, and it should have been made in that era too. A piece of jewelry made well but pretending to be older than the time it was actually made in, is just a reproduction. What we show here is what we think is a good piece of future antique jewelry. Recognizable made somewhere around 1980 and made in the best jewelers traditions. Not only that, the center stone, a Colombian emerald of approx. 1.80 crt, is of a quality we never had in our collection. The cheering gem is beaming its intense green light in a way making anybody looking at it, immediately falling in love with it. We count ourselves lucky to have been able to get this beauty into our collection. Country of origin: Although it does not carry any legible control marks we believe this to be of Belgian origin. Diamond(s): Eight baguette (long rectangular) cut diamonds with an estimated weight of ± 0.48ct. (colour and clarity: F/H, vvs/vs). - All diamond weights, color grades and clarity are approximate since the stones were not removed from their mounts to preserve the integrity of the setting. Precious stones: One Colombian emerald with an estimated weight of ± 1.80ct. Birthstones: Emerald is the birthstone (or month stone) for May and diamond for April. Resizing: Free resizing (only for extreme resizing we have to charge).